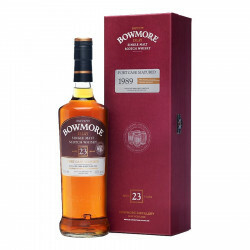 Bowmore 23 Years-Old Port Matured is well balanced, loose and greedy. Rose petals fragrance matches perfectly the apricot and roasted nuts with light and peated Bowmore whisky notes. Bowmore 23 Years-Old is an exeptionnal Single Malt distilled in 1989, unchilfiltered and bottled in a very limited edition. This whisky presents a whole range of extraordinary perfums and flavors with its slow aging in Porto casks whose aromas melted in peat and typical Bowmore smoke. Bowmore 23 Years-Old Port Matured is well balanced, loose and greedy. Rose petals fragrance matches perfectly the apricot and roasted nuts with light and peated Bowmore whisky notes. A truly exeptionnal product. Nose: loose and greedy, rose petals aromas bloom delicatly through the nose, apricot sirup and roasted nuts associate with peated seascape and smoke. We also noticed flower fragrances (lavender, peony) and dark fruits (blackberry, blackcurrant). Palate: Porto casks aging stands with an amazing floral and fruity taste. Heather honey aromas, dried grapes, and violet matches perfectly with Bowmore's complexed peat. As the tasting continues, peated notes become more salty and spciy. Finish: continuously, a wide range takes place with new greedy and buttery aromas. A fruity and sugary essence reminds the taste of an apricot pie, enjoyed on a sunny warm summer day. Quickly this memory gives place to ashy, smoky and herbaceous tabacco, salty and spicy (tapenade, cinnamon, netmeg) and floral.